These guidelines for Earthquake Geotechnical Engineering Practice in New Zealand were originated by a working group of the New Zealand Geotechnical Society. The idea for the working group came from a panel discussion ‘Geotechnical Seismic Design Standards’ which took place during the NZGS Biennial Symposium ‘Earthquakes and Urban Development’ held in Nelson from 17–18 February 2006. The main impetus for the panel discussion was the replacement of NZS 4203:1992 Standard for General Structural Design and Design Loading for Buildings, by NZS 1170.5:2004 Structural Design Actions Part 5: Earthquake actions – New Zealand. 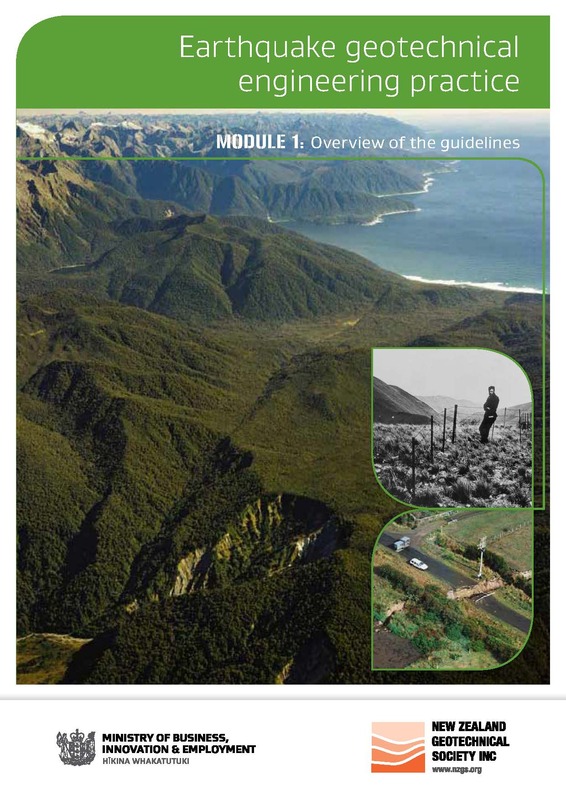 While far from complete, NZS 4203 gave some useful guidance to geotechnical practitioners. However, NZS 1170.5 specifically excludes design of soil retaining structures and civil structures including dams and bunds, the effects of slope instability, and soil liquefaction. This document, Module 1, presents an overview of the various modules that make up the Guidelines, see Section 6, introduces the subject of earthquake geotechnical engineering, provides context within the building regulatory framework, and provides guidance for estimating ground motion parameters for geotechnical design.